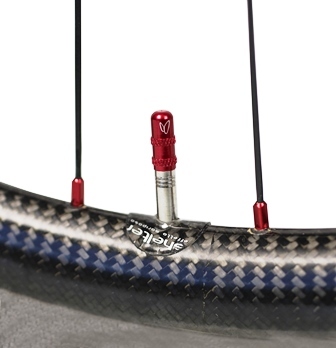 Shelter Wheel Kit is made of 35 washers that fit snugly over the valve stem, gluing at its base, with an elegant and almost invisible silencing effect. It's also great to balance wheels, with an additional vibration-reducing action. Shelter Wheel Kit is made of 35 washers that fit snugly over the valve stem, gluing at its base. With minimum bulk and weight, they provide an elegant and almost invisible silencing effect, cancelling unwanted valve movements and vibrations. The re-sealable bag makes sure washers retain their properties if needed for successive applications. Once Shelter washers are applied on the rim, it’s possible to remove the valve an re-insert it without loosing the silencing effect. This is just one application of our Shelter Wheel Kit, but there’s more. Nobody would drive a fast car whose wheels haven’t been carefully balanced after mounting tyres on. Current high performance bicycle wheels, with fancy ceramic bearings, lightweight carbon rims, cannot deliver their full potential if not properly balanced. It’s an easy task that only requires a Shelter Wheel Kit, a wheel truing stand (or a bicycle turned upside down..), patience and some minutes per wheel. Mount the tyre (and eventually disk) on the wheel, so that the wheel is in its rideable form. IMPORTANT: if balancing a tubeless wheel, make sure there’s very little or no liquid sealant inside (that can be added later). Liquid sealant spreads while riding without creating wheel unbalance, but it will interfere with static balancing. Place the wheel on a truing stand and make sure it can rotate freely. With a gentle push, make the wheel spin. After a few complete rotations in the direction of the push, the wheel will enter a pendulum phase where it makes partial rotations, back and forth. Behaving like a pendulum, the excess of weight on the wheel is subject to a restoring force (due to gravity) that accelerates it toward the equilibrium position. Amplitude of swings will reduce until the wheel stops: the lowest point is where the excess weight is. Often wheels stop with the valve at the lowest point… but sometimes uneven weight distribution on the tyre or less-than-accurate carbon fiber lay up overcompensate that, and the lowest point is not corresponding to the valve. Keeping the lowest point of the rim/tyre as reference, identify the opposite point on the rim (you can find it using a ruler, aligned with the lowest point and the wheel axle) and adhere a Shelter washer there. Repeat the process from #1. Each time the heaviest point may move slightly (because of friction in the hub), but it will normally remain within a +-10 cm (4 inches) range. The wheel is balanced when, upon making it turn, IT WILL STOP WITHOUT ENTERING THE PENDULUM PHASE (it won’t change its rotation sense). With each subsequent spin, the lowest point when the wheel stops is a random point on the circumference, changing every time and depending on bearing friction. Washers can be adhered one on top of the other, or side by side, on top of the rim or on its side (depending on rim profile/size). A good trick, although not always possible, is finding a spoke that’s close to the lightest point of the wheel and cutting the washer on one side, so that the washer can be put around the spoke. Each Shelter washer weights around 1 g. Typical wheel unbalance ranges from 4 to 12 grams. That’s an added bonus when balancing a wheel with Shelter washers. The transmission of vibrational energy through any structure can be reduced by introducing visco-elastic materials at discrete points. It’s exactly what Shelter does, contributing to reduce vibrations on very stiff wheels.